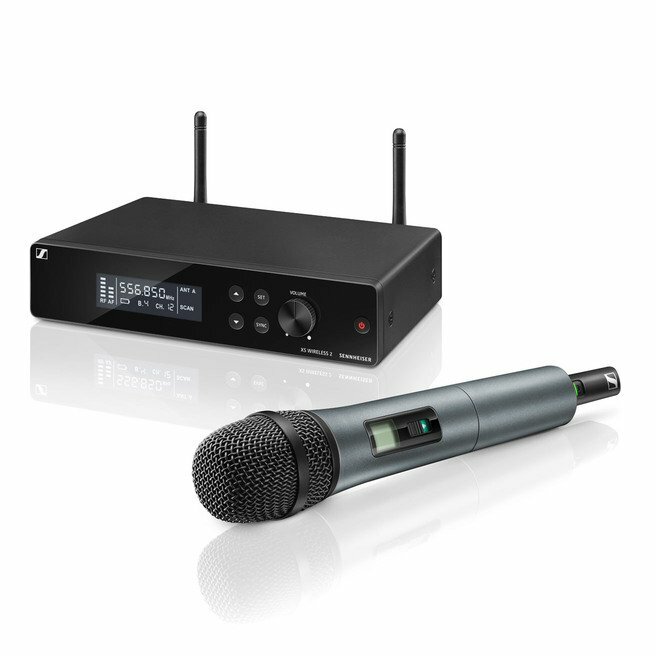 Sennheiser XSW 1-825 DUAL / XSW 1-835 DUAL - - 2-channel wireless system for singers and presenters. 2-channel wireless system for singers and presenters. Stable UHF band, built-in antennas and streamlined interface. 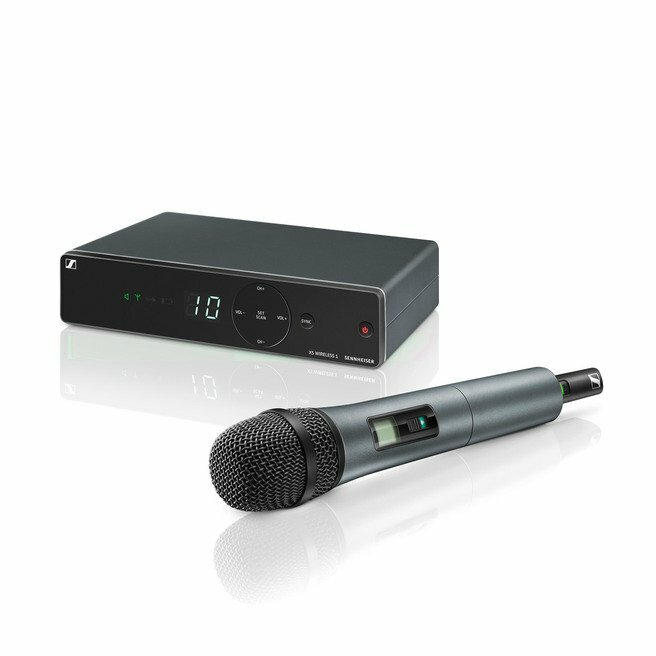 XS Wireless 1 DUAL is a 2-channel wireless system for singers and presenters. Designed with ease of use in mind, these analog UHF systems feature a sleek dual-channel receiver with built-in antennas and the streamlined interface from Sennheiser's popular XS Wireless 1 series. How do I find a frequency (ie: perform a frequency scan)? 1) Press the "UP" or "DOWN" button to scroll through the menu options on the receiver. 2) Press the "SET" button to select the SCAN option. NOTE: The unit automatically selects the next available unused frequency. 1) Press and hold the "SYNC" button on the transmitter until the "SYNC" symbol flashes on the receiver. 2) Press the "SYNC" button on the receiver. NOTE: If a frequency SCAN is performed and no available frequencies are found then the SQUELCH setting will need to be increased. Once the SQUELCH setting has been increased repeat the steps of the frequency scan and then SYNC accordingly. What adjustments can I do to improve sound quality? This is how sensitivity the microphone pick up is and this is adjusted on the microphone/body pack itself. Typically for general speaking the sensitivity should be set around -15 to -18 dB. You will need to adjust this depending on the exact application. Adjusting closer to 0 dB is will be more sensitive and further away from 0 dB is less sensitive. If the microphone is too sensitive the input will overload the microphone and the AF level will peak and the audio will be clipped. It is suitable to adjust the level so that the AF peak indicator lights up only briefly during the loudest passages. This is how strong the signal is exiting out of the receiver into the sound board/speakers/etc. Typically this will be set to 0 dB or +6 dB if connected to equipment which is expecting a line level input . 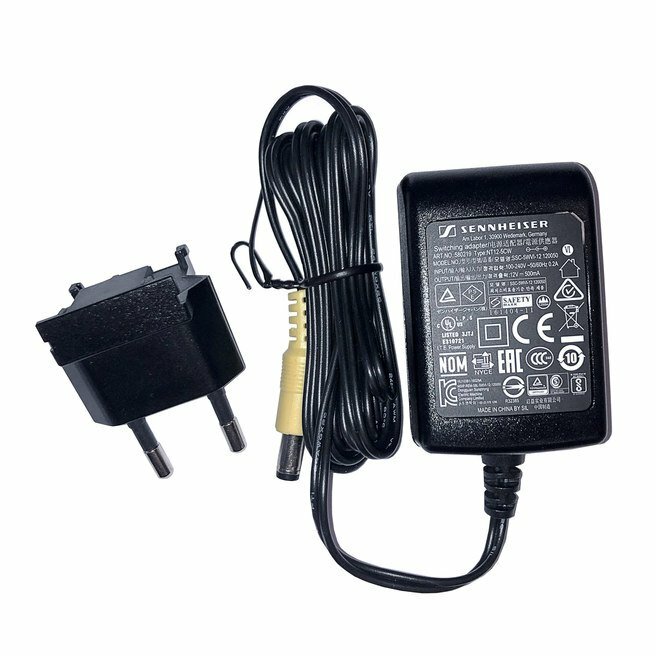 If you are connected to equipment expecting a mic level input you will typically need to drop this AF output down to -24 dB or -30 dB. If your equipment has the option, it is best to try to run the equipment in line level mode. NOTE: If the AF Output is too high it may over load the input on any connected equipment (sound board/speakers/etc) and may create noise in the form of distortion/rumbling. Next check to make sure that the "MUTE" switch is not accidentally engaged (either fully or partially). The best way to do this is click the mute switch on and then back off. After checking the "MUTE" switch if no audio is present make sure that the microphone element is securely in place. If using a body pack transmitter make sure that the microphone or guitar cable is securely in place by disconnecting it and reconnecting it. NOTE: On the handheld microphone the capsule is locked into place and cannot come loose.